Task: An urban development scenario should be designed for the transitional area between Berlin-Zehlendorf and town of Teltow (Brandenburg), that solves the problems of the resulted development (strong spatial and programmatic separation, no relation to green spaces) and indicates a vector of future long-term structural and spatial development. Site: This area with a character of an “in-between city” is an atomized unlinked mix of heterogeneous residential patches (single-family houses, villas, apartment blocks, dwelling from the 1930-60s), strips of allotment gardens, industrial zones and landscape fragments. The Teltow Canal, which lies between two settlements, acts as a barrier and its potential as a landscape structure is still not taken into account. Statement: The society is getting older, more individual and flexible. Desire to stay fit longer or to succeed in self-promotion increases the attractiveness of active lifestyle in public spaces. Therefore, a European city of a nearest future should orientate itself towards a concept of a sport-friendly city and offer itself as a medium for spontaneous physical movement. 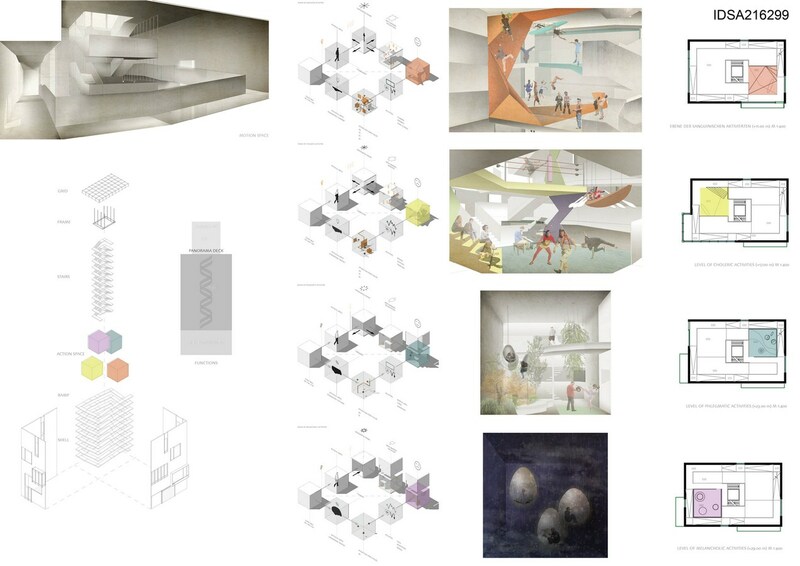 The project consider a city as a space of a person`s motion, in sense of non-motorized physical activity. The people`s motion in urban space is represented as a system of 3 components: TARGETS, PATTERNS and ENVIRONMENT. 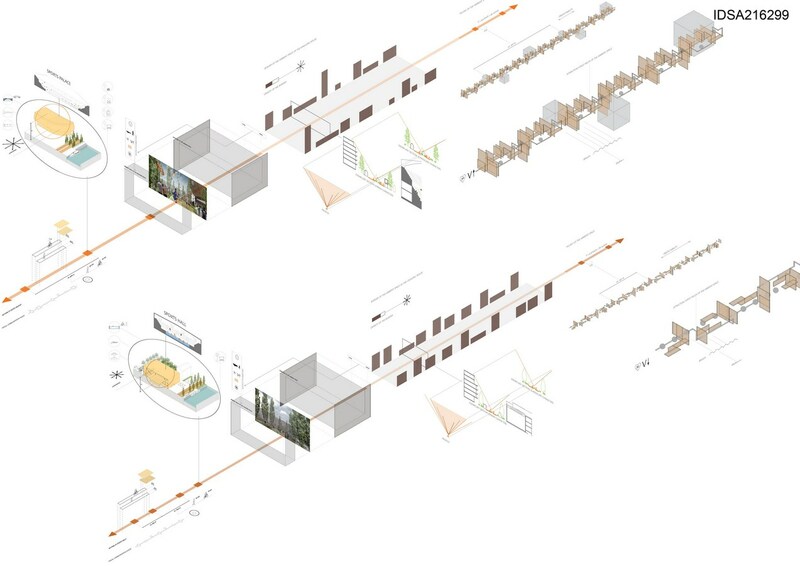 Targets are defined by a hierarchy of localities` typologies (from a seclusion point to a sports-cluster). The 4 ROUTES of the SPORT-AVENUE respond to the different movement patterns. The AMBIENT SPACE of each ROUTE contributes to the environmental variety. 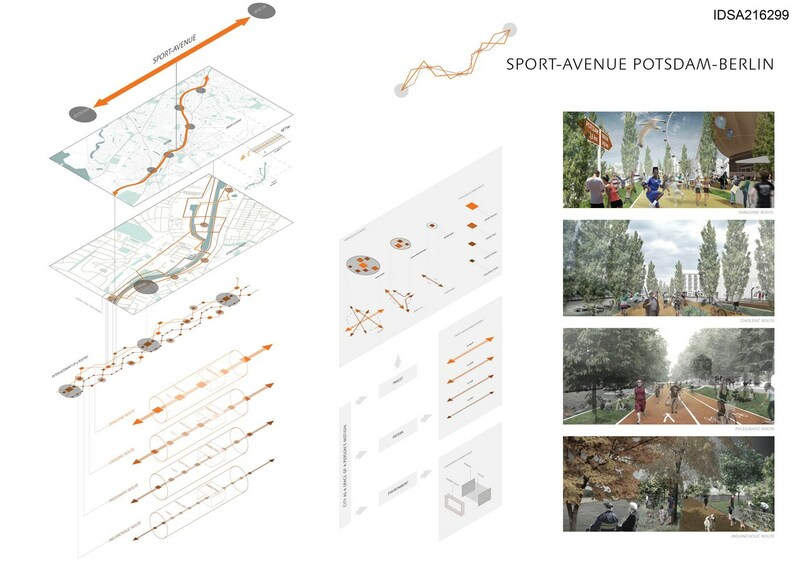 1) The SPORT-AVENUE is a connector of the existing fragments on the way POTSDAM-BERLIN. It contributes to revitalization and dynamisation of the Teltow Canal surroundings. The SPORT-AVENUE links the existing hiking trails, promenades and streets with the destinations to a complete 35 km long network of cars-free public roads. To ensure practicing sport activities in public places, the content of the ROUTES is designed regardless of physical conditions, age or employment of people. Rather, the movement style of people in the city depends on the mental perception of occurring situations. The 4 ROUTES are formed according to the nature of people`s interactions and reactions – so according to 4 types of temperament (sanguine, choleric, phlegmatic, melancholic). The temperament-related organization of each of the 4 ROUTES is generated by a synergy of 3 elements: TRACK (physical space), AMBIENT SPACE (mental space) and SPORT-OBJECTS (meeting epicenters). 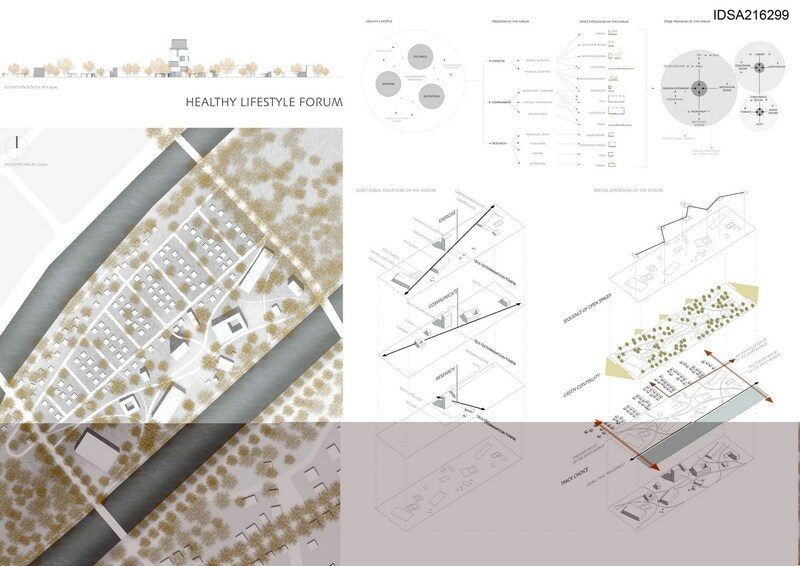 2) A missing local attraction point in the area Teltow-Zehlendorf and concrete connecting (spatial, programmatic and infrastructural) arrangements within the SPORT-AVENUE find its expression in the HEALTHY LIFESTYLE FORUM with the SELF-DETERMINATION TOWER. The FORUM is a sort a of a park structure, where the buildings are thought to act as solitaires on a meadow – with the reference to the Greek Agora as a kind of meeting place with a focus on intellectual and cultural activities. It has 3 tasks: to exercise a healthy lifestyle, to communicate information about it and to make research concerning health.